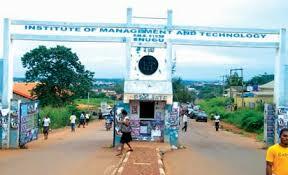 Institute of Management and Technology (IMT) Enugu Full Time National Diploma, ND and DEGREE Acceptance Fee Payment and Registration Guidelines Newly Admitted Students for 2018/2019 Academic Session. This is to inform all newly admitted students of the Institute of Management and Technology (IMT) Enugu National Diploma, ND and DEGREE programmes for 2018/2019 academic session that they are to commence payment of acceptance fee and registration process immediately. Students log in to the portal, Generate payment invoice for Biometric and Acceptance Fee. Select Interswitch as the Payment Option and click on BOOK. Student proceed to the bank, and Pays with the generated Invoice. Students returns from the bank , login to the portal and print Tuition and Hostel fee receipt. You are required to accept this offer by prompt payment of the Acceptance, fee of Twenty-Five thousand (N25,000.00) for the 2018/2019 academic session within two weeks of the offer after which the admission may lapse. -You should on acceptance of this offer report to your Head of Department for registration. If it is discovered at any time that you do not possess any of the qualification's, you will be expelled from the institute unconditionally. Information relating to schedule of fees, accommodation facilities and medical examination should be obtained from the Bursar and Director of Student's Affairs of the Institute.